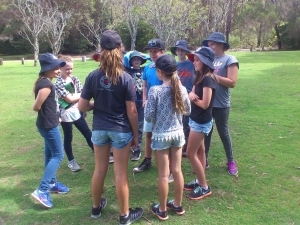 Bournda Environmental Education Centre offers a range of Challenge Games that can form a part of any day or overnight program. Challenge Games are a series of challenging activities that require team work and cooperation to be completed. Students work in groups to solve challenging problems using creative thinking, problem solving and team work. Each game has a set of rules that the students must follow. Aspects of leadership, team work and perseverance are discussed with students as they complete the challenges. Challenge Games work well as an activity to include as a session in a day program or overnight camp. Challenge Games also form a part of our Leadership Programs and complement Peer Support activities. Crocodile Safari – students must cross a ‘crocodile infested’ billabong without losing any team members. Poison River – all team members must work together to negotiate a ‘poison river’ and cross safely to the other side. Puncture Drum – team members must work together to fill a leaky drum as quickly as possible. Spider Web – students must pass through a hole in the ‘spiders web’ using the assistance of other team members. Trust Me – students guide each other through an obstacle course with one student being blindfolded. Shapes Game – students are blindfolded and have to work together to find their partner.